15" Jingles is a must have this Holiday season! Very easy to make! 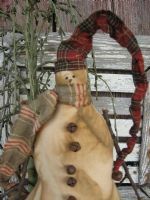 He is made with brushed flannel and scraps of homespun for his hat & scarf. Easy to follow directions help you put this guy together fast! Grunging instructions included.